They're an ocean apart, but the former first lady sees similarities between their beginnings in the public eye. Former first lady Michelle Obama knows a thing or two about being thrust onto the world stage without any prior experience to truly prepare for it. It's something she wrote about in her new memoir, "Becoming" — and it's also something she's happy to share with one fellow American in particular. 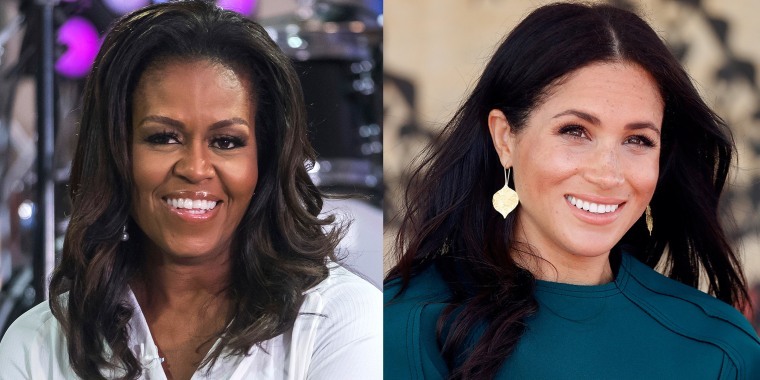 In a Q&A for the January 2019 issue of Good Housekeeping, Obama offered up some advice to expatriate and newly minted British royal, Meghan, Duchess of Sussex, who now finds herself standing in that intimidating global spotlight. "Like me, Meghan probably never dreamed that she’d have a life like this, and the pressure — from yourself and from others — can sometimes feel like a lot," the 54-year-old explained. "So my biggest advice would be to take some time and don’t be in a hurry to do anything." It may be a little late for that tidbit, given the duchess has already hit the ground running by launching a successful charitable endeavor to help support a vital community kitchen for the survivors of the 2017 Grenfell Tower fire, a project she began before she even married Prince Harry in May. Since their nuptials, the former Meghan Markle has proven herself a powerful speaker and an adept representative of the royal family — a family that will soon be a little bigger thanks her and Prince Harry's wee royal on the way. But, still, Obama cautions against striving for too much too soon. "I spent the first few months in the White House mainly worrying about my daughters, making sure they were off to a good start at school and making new friends, before I launched into more ambitious work," she recalled. "Once I was ready, I chose to work on issues that I had a strong personal passion for. I chose children’s health because I’d lived through the difficulty of raising healthy kids as a mom. I focused on increasing access to education because I saw the power of education in my own life — that’s why I spent years talking to minority and first-generation students about getting to and through college. I wanted to do whatever I could to help them rise above the doubters that would come their way." The former first lady urges the 37-year-old to give herself some time to figure it all out, rather than diving headfirst into even more initiatives. Obama believes the results will be worth it. "There’s so much opportunity to do good with a platform like that — and I think she can maximize her impact for others, as well as her own happiness, if she’s doing something that resonates with her personally." That's just the latest bit of wisdom from the woman who's been busy promoting her book and stressing that important message about really knowing oneself. And the reason she knows it's so important is because, even after two terms as the matriarch of the nation's first family, Obama struggles with self-doubt, too. "I always ask myself, 'Am I good enough?'" she said at an event held at Elizabeth Garrett Anderson School in north London this week. "I still feel, at some level, I have something to prove because of the color of my skin, because of the shape of my body, because of ... who knows how people are judging me?" But she never lets it stop her. It just "takes some time and it takes some maturity" to navigate those feelings.